On Monday's NBC Today, correspondent Michelle Franzen reported on the left-wing "Occupy Wall Street" protests in New York and proclaimed: "Protesters fed up with the economy and social inequality turned out en masse over the weekend....Voicing their discontent and marching for change." On Saturday's Nightly News, Franzen offered a similar report, including another sound bite from Warren, who asserted the Wall Street protests were "a liberal version of the Tea Party." He added: "I think this could potentially carry over into the 2012 elections and get people to the polls." That media "obsession" with the Tea Party actually began as an attempt to completely dismiss it. Noting nationwide Tea Party tax day protests on the April 15, 2009 Today, chief White House correspondent Chuck Todd remarked: "There's been some grassroots conservatives who have organized so-called Tea Parties around the country, hoping the historical reference will help galvanize Americans against the President's economic ideas. But, I tell you, the idea hasn't really caught on." As the Tea Party gained momentum, the media changed tactics, demonizing it as racially motivated. In an interview with Jimmy Carter on the September 14, 2009 Nightly News, anchor Brian Williams highlighted the former president's smear of the movement: "A certain number of signs and images at last weekend's big Tea Party march in Washington and at other recent events have featured racial and other violent themes, and President Carter today said he is extremely worried by it." In contrast, NBC's reporting on the Wall Street protesters was free of criticism. In fact, on the September 27 Today, news anchor Natalie Morales announced: "Protesters camping out on Wall Street got an unexpected visit last night from filmmaker Michael Moore. 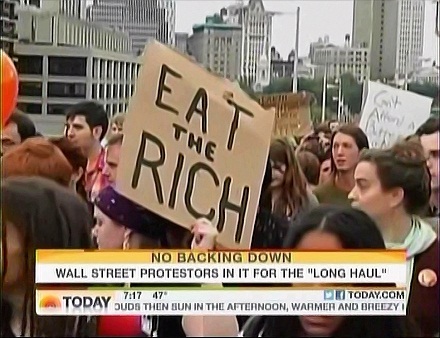 The 'Occupy Wall Street' protest against corporate greed is in its second week. Protesters called Moore's visit a 'morale boost' after police arrested 87 demonstrators this weekend." However, on the March 24, 2010 Nightly News, Williams warned viewers about the Tea Party: "It's getting ugly as anger over health care reform erupts into some over-the-top rhetoric, including threats now against members of Congress....It can now be said that the debate over health care reform has gone too far. It's now veered into threats of violence." On ABC's Good Morning America, Bianna Golodryga reported: "And the arrest of over 700 people in a weekend march across the Brooklyn Bridge has reinvigorated anti-Wall Street protestors. They now say that their message into going national is in, and they're digging in for the long haul." On CBS's Early Show, Betty Nguyen noted: "Here in New York, those anti-Wall Street protesters are staying put. The activists are camped near the financial district. Demonstrations have entered a third week, and over the weekend, some 700 protesters were arrested as they crossed the Brooklyn Bridge. The groups plan to continue their demonstrations indefinitely."